So popular is the new Chinese restaurant at the Tin Can Bay Country Club, that people are travelling from Gympie to dine there! But how did owner, Eric Guan, who was born in China and now lives at Hay in NSW, start a business in Tin Can Bay? It turns out the Country Club’s greenkeeper has family in Warialda, where Eric was living at the time, who informed him the previous contractor had left. 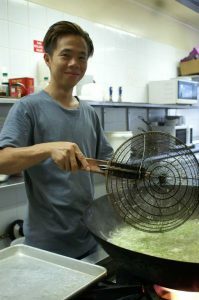 Eric started out as a part-time waiter in Sydney, then seven years ago opened a restaurant in NSW Bingara, where he worked as a Kitchen hand and learnt to cook in his own restaurant. This restaurant is still successfully trading today. This move to Tin Can Bay is proving positive for Eric, with his menu at the Country Club appealing to locals and visitors. Head Chef, Jo Cheah, does most of the cooking in the restaurant – she first learnt to cook in Japan twenty years ago. Jo came to Australia in 2000 and continued learning to cook from her brother who owned a restaurant on the Gold Coast. Things are going well. “The food is good and I trust my Head Chef, Jo. I think our restaurant has been accepted into the community. “We are listening to our customers, and always have room for improvements, and Eftpos is now being installed in the restaurant,” said Eric. “My family run restaurants in Sydney and Newcastle, they taught me a system and how it goes. Including myself and family, we have ten restaurants – you can say it is a family thing and we share our experiences and that’s how we survive.” And thrive, it seems! So book in a group for a banquet, or come in for the $12 lunch special and check out the improvements to the club whilst you are there! Open seven days, 12 midday to 2pm and 5.30pm to 9pm, book today on 5486 4231.